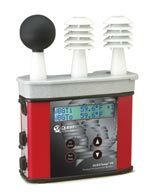 Quest Technologies has added the QUESTemp° 44 and 46 to its portable, heat stress instrumentation series. These instruments are designed to evaluate indoor and outdoor environmental conditions for the potential to cause heat stress or heat-related injuries. Their Waterless Wet Bulb sensor offers traditional heat stress monitoring without the maintenance.